Every year Waller celebrates their drivers during National Truck Driver Appreciation Week. 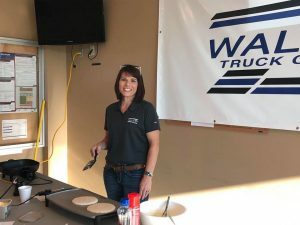 This year was no different, with Waller spending the week grilling pancakes, throwing a potluck, and enjoying the MHC Kenworth annual Friday grillout. Some Waller office employees began work as early as 6:15 am to begin flipping flapjacks for drivers. The breakfast went deep into the morning, with Safety Director Tim grilling sausages and Financial Analyst Alissa cooking pancakes. Waller also held numerous prize drawings at random throughout the week, supplementing on Tuesday and Thursday with even more chances to win. Trucker Trivia on Facebook and Qualcomm was a huge win for many drivers, with six each day winning just for answering questions correctly. Every year, Waller hosts an office potluck. 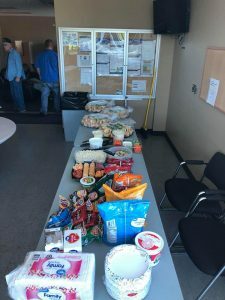 This is the office employees’ chance to show even more appreciation for drivers than usual by feeding them themselves. Friday was the most fun of all, with massive drawings that had over 30 drivers winning gift cards, 32″ TVs, and pit passes to the Kansas City NASCAR race in October. MHC also came out to grill up some grub, feeding drivers chicken, brats, and burgers. 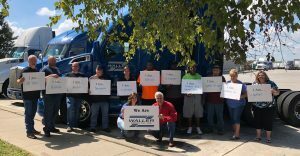 The office staff also took the opportunity to take a photo with drivers, showing what Waller stands for as a family and a team. We had a blast appreciating our drivers during their special week! We look forward to doing it throughout the year until next time. To apply to join the team, you can fill out an application here! We look forward to hearing from you.